Are you prepared for the inevitable? 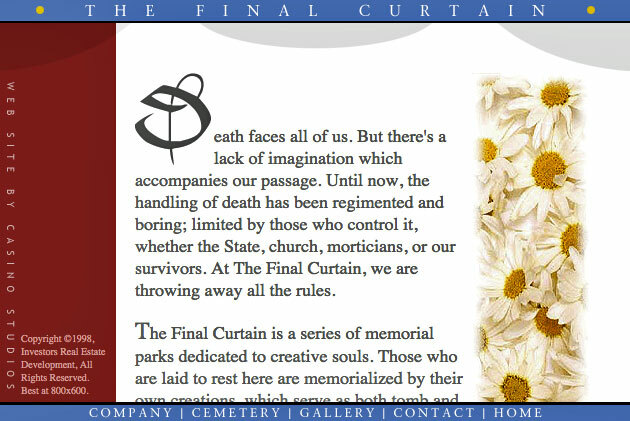 The Final Curtain was an over-the-top parody of the death care industry, designed to provoke people to think about their feelings about life, death and burial in a new light. To Joey Skaggs, the death care industry is a giant corporate scam, exquisitely successful at commercializing death. Pre-need insurance, embalming services, open coffins, headstones, ground space, religious sanctity, and ancillary products are merchandized to con people into spending money under the premise that this is the right thing to do either from a cultural or religious perspective. Using calculated public relations and marketing tactics, death care providers have elevated spiritual reverence in the funeral parlor to a high art. Their ploy is to appear to pay appropriate tribute to the dead, making a good show for the mourners. Ultimately, it’s a waste of space and resources, and a burden to the natural environment at the financial and emotional expense of their clients. In 1998, Skaggs put together a volunteer international team writers, artists, and designers to create The Final Curtain, a website purporting to represent a voracious real estate development company, featuring a Disney-like memorial theme park and mall which included a traveling time share program for the deceased. The Final Curtain catered to creative individuals (visual artists, poets, performers, etc.) who wanted to construct their own iconoclastic, irreverent, and/or humorous monuments, mausoleums, and urns. Skaggs sent out press announcements and placed classified ads in numerous newspapers across the country which said, “Death got you down? At last an alternative: www.finalcurtain.com.” This led the press and public to the website. There they found an elaborate company site complete with a business plan, architectural renderings and actual designs for artists’ memorials created by Skaggs’ co-conspirators. To see more memorials, visit http://finalcurtain.com–>Gallery–>Monument Gallery. The parks, planned to be franchised in major metropolitan cities around the world and open to the public, would be a haven for those who wished to be free of the shackles of the current death-care industry’s morbid grip on life’s passing. 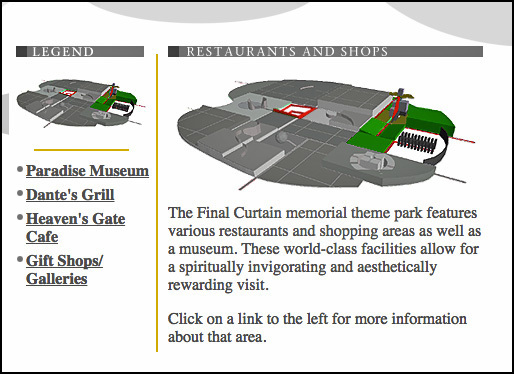 The Final Curtain memorial theme park concept was so outrageous, yet so plausible, that it was widely reported in newspapers and magazines, and on television, radio and the internet, without question. The public both embraced and attacked it. Venture capitalists expressed interest in investing. The States of Colorado and New Jersey threatened investigation into the illegal sales of securities on the Internet. A corporation threatened legal action for trademark infringement. Television and Hollywood movies were proposed. And artists submitted burial concepts hoping to be selected by the company for a free grave site. Joey Skaggs perpetuated the virtual burial business by setting up a bogus office with a telephone and an answering machine and responding to the barrage of requests for interviews. That he played all the parts of the company’s executives during interviews, i.e., Managing Director Michael Varley; Marketing Director Stuart MacLelland; and Associate Marketing Director Paul Corey, did not deter a single journalist. He talked about the artist-designed adventure rides such as the “roller coaster of life and death,” and the interactive playgrounds where children would frolic on artists’ grave sites. He described the shops that sold mausoleum replica key chains and coffee mugs. The Final Curtain was, for all intents and purposes, a real amusement park for the dead. Funeral directors were all for it. They oozed delight that at last big investment money was helping to merge the death care industry into the entertainment world. Skaggs always leaves clues in his performances. In this case, his own monument, mounted in the Monument Gallery, under the name of Joseph Sullivan, was a screen animation of Skaggs morphing from flesh to bone, with a worm crawling in one eye and out of his mouth. Post script: In November of 2009, five months after the death of Michael Jackson, Joey Skaggs began receiving inquiries from Jackson fans. Jackson had said “This is it. This is the final curtain call” during his press conference for the upcoming “This is it” tour. The fact that Joey Skaggs had perpetrated The Final Curtain hoax years earlier, and the fact that Michael Jackson’s passed away after saying those words, seemed to convince people that Joey Skaggs and Michael Jackson had conspired to fake Jackson’s death. Many people believed Michael Jackson was not dead, but that Skaggs had helped him create the “Michael Jackson Death Hoax” so he could disappear. They implored Skaggs to reveal where Michael Jackson was. The demand became such that Skaggs posted a notice on his Facebook page, hoping to quell the concerns. But to this day, he still receives frequent inquiries about Michael Jackson’s whereabouts.